Vista Gold Australia Pty Ltd invite you to learn more about this exciting project. ﻿The Mt Todd mine site is located approximately 50 km north of Katherine and 250 km south of Darwin. 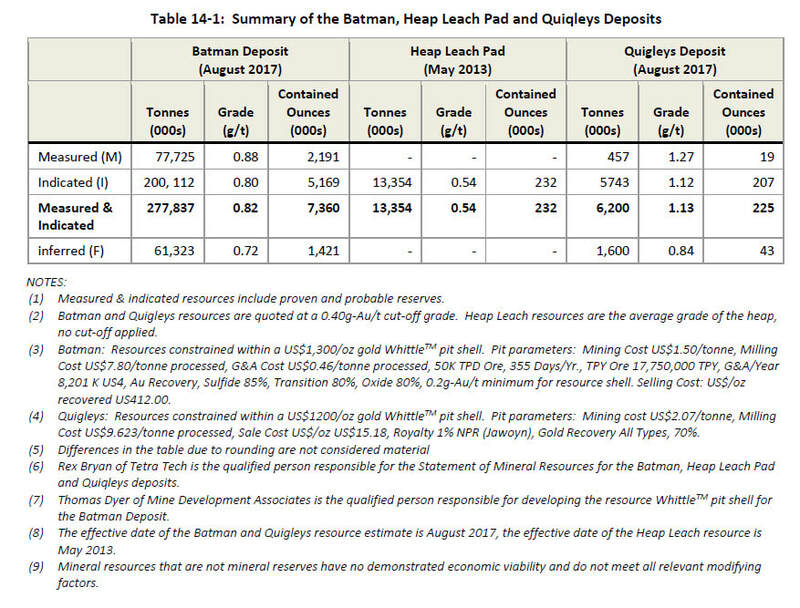 The site covers a mine tenement of more than 153,700 ha, which includes both the Batman and Quigley's gold deposits. The site was acquired by Vista Gold and its wholly owned subsidiary Vista Gold Australia in 2006. Currently not in production, Vista Gold is working with the authorities to obtain the necessary permits for the mine prior to making a final investment decision on the project. A favorable investment decision could lead to a two-year construction phase employing approximately 450 people with an ongoing workforce of 350 during operations. We are now finilising the Management and Mitigation Plan (which is required prior to commencement of "works") and Offset Proposal. Both of these are well advanced. ​Mt Todd commenced its annual 2018/19 wet season release of treated water on 4th Jan-19. We are targeting a total of 1.5GL this wet season, in accordance with our Waste Discharge License. When there is sufficient flow in the Edith River we are able to release water via our automated pumping system. This is the continuation of the significant reduction of the water inventory held at Mt Todd. In the past four years we have released ~ 7.2GL of treated water. More the half of the volume of water in the old Batman Pit (RP3) has now been treated and released. Water collection and storage is the biggest environmental issue facing the Mt Todd site. Since the mine ceased operations in 2000, mine effected water has been collecting in the Tailings Storage facility (RP7) and the Waste Rock Dump Dam (RP1). As required this water has been pumped and stored in the Batman Pit (RP3). Regardless of the when the mine goes ahead this water requires treatment and release from site as there is a net positive historical 1.5GL of water for Mt Todd Mine Site each year. Hence the need to release water each wet season. As at 1st Dec-18 we had 7.1GL less water on site today then we had five years ago. We still have a total of 8.5GL (4.8GL in Batman Mine void) at Mt Todd. The remaining capacity is 10.3GL across the site. We have installed a sprinkler system that operates during the dry season that sees more water evaporated. This is great as it means less water to treat and release. Call the Mt Todd Community Feedback Line at 08 8941 9108 with any issues, comments or questions you may have – and we will listen. You can also reach us through this website at http://www.mttodd.com.au/contact-us.html - simply click on “Contact Us” tab and select any one of the contacts listed or fill out the online comment form at the bottom of the page.